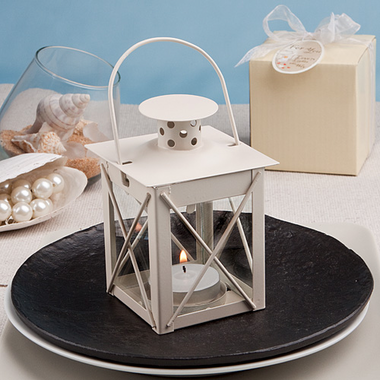 This is a lovely tealight lamp mini lantern favor that will add a suggestion of moonlit mystique to your event tables or unique wedding decorations. Perfect for a New Orleans theme wedding or party, these mini lanterns would be darling thank you gifts for a black and white wedding or theme party. *Comes brilliantly packaged in an ivory colored box, wrapped and tied with a white organza ribbon and an attached oval "For You" tag that displays the message "Love Lights the Way"
You may also purchase personalized tags or stickers for $.35 each.